The Center for Women In Coalition is the research, policy and activist wing of the Department of Women’s Studies at the University of California-Riverside. It was founded in October 1995 by women faculty from across the disciplines in the College of Humanities, Arts, and Social Sciences. CWIC is committed to scholarly, policy and activist engagements with women, gender and sexuality issues as these are constituted through classed, ethno-racial, national, geopolitical, religious, and linguistic differences. In so doing, CWIC follows the creative and powerful paths of intervention forged by native, immigrant, U.S., and postcolonial women of color, as well as women based in the global South. 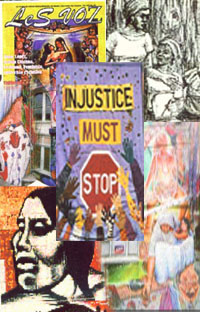 CWIC seeks to further critical dialogues across various multiracial, anti-racist, national and transnational feminist projects of social justice. CWIC is committed to working across geographical and political, as well as academic, borderlines, in the interest of intellectual and political collaboration and innovation. Many of its projects have focused on the disjunction between academic and activist feminisms in the United States and on the internationalization of feminist theorizing and practice. Feminist coalition work, and research, is polversal and critical. CWIC seeks work across many borderlines of power especially within knowledge-production itself. It is committed to working in alliance with community leaders, community-based organizations, activists, advocates and policy makers. Please contact us at centerforwomenincoalition@googlegroups.com. if you are interested in joint projects of research and action. CWIC is currently housed in an office in Interdisciplinary Studies Building (Office 2026). It is administered by a governing board. The basic operating budget is provided by the Office of the Dean of the College of Humanities, Arts, and Social Sciences. CWIC extends its deepest gratitude to Anirban Sengupta, Abhishek Das and Samiran Ghosh of KolWeb whose patient and meticulous attention and care has made this website possible.